Ballpark Digest is previewing what every MLB team is doing to begin the season, both on and off the field, as the 2019 season is underway. Up next: the San Francisco Giants and Oracle Park. A new name was not the only change to Oracle Park over the offseason. Along with completing a naming-rights deal with Redwood-based Oracle to replace the AT&T Park moniker, the Giants replaced the videoboard, revamped the ballpark’s premium areas and gathering spaces, and introduced new food items. One of the biggest changes to hit Oracle Park this season will be the installation of a new videoboard. Coming in at 153.28′ wide by 70.87′ high, the new display is more than three times the size of the previous videoboard–which had been in place since 2007–and offers twice the resolution. It is also being touted by the Giants as the first “4K” display in Major League Baseball. The videoboard was installed as part of a $10 million project, the largest single capital improvement the Giants have completed since Oracle Park’s opening in 2000. It also helped to kick off a five-year capital improvement plan that the Giants are aiming to complete by 2024, which will be Oracle Park’s 25th season. Other new features this year include the Cloud Club (above), an all-inclusive lounge located on the Suite Level. The Cloud Club was created when the Giants merged six existing suites into a single club, resulting in a space with a capacity of 140-150 that includes lounge seating, an indoor bar, and television monitors. Elsewhere, the Giants added an outfield gathering space named The Waterfront–which is replacing the last few rows of bleacher seating under the scoreboard. More gathering spaces were created around the ballpark by removing the last row of seats in the lower box seating areas around the Promenade Level. 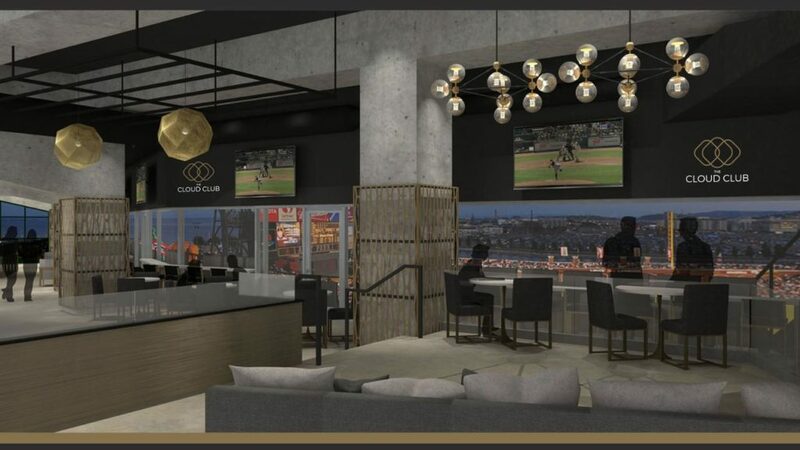 In addition, the Blue Shield Field Club has been redesigned, while the Giants have also installed The Lexus Lounge in place of the former umpires’ clubhouse, giving exclusive field level access to ticket holders in the Giants’ Lexus Dugout Club. That slate of improvements will bring some big physical changes to Oracle Park, but the Giants did not stop there in revamping the ballpark’s offerings for 2019. In conjunction with Oracle Park food service provider Bon Appétit Management Company, the Giants are introducing several new menu items for the 2019 campaign. New to the ballpark this year is Super Duper Burgers, a local option that emphasizes a commitment to sustainability, which takes over the former McGraw Grill space on the Promenade Level. Also new for this season is Organic Coup’s certified organic corn dogs, available at all Gilroy Garlic Fries Stands around the ballpark. Edible cookie dough will be served up at Doughp on the Promenade Level, while street-style tacos, fish tacos, and Irish Cheddar mac and cheese with a choice of toppings are also joining Oracle Park’s menu. Rendering courtesy San Francisco Giants.